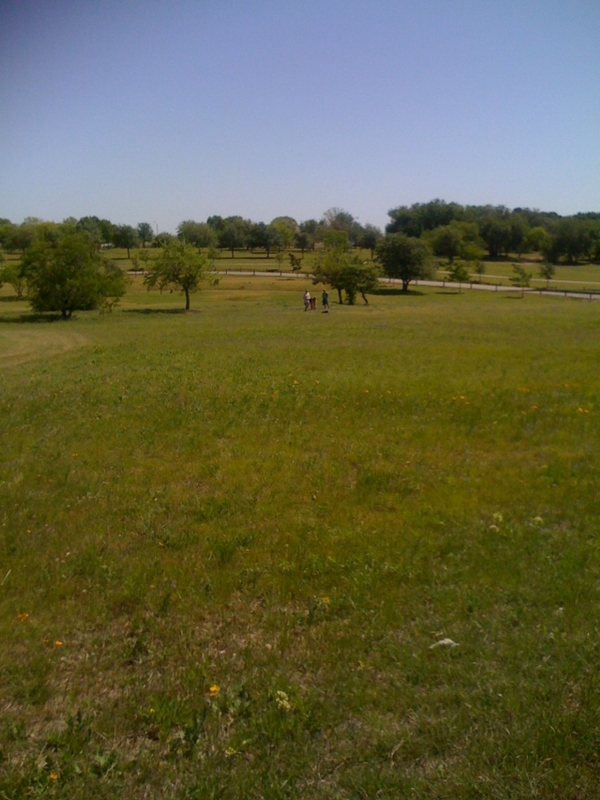 The group checked out the new disc golf course near the Benbrook subdivision in Leander. The course is brand new. And it shows. They are still working on clearing out trees. A crew had come by earlier, cut some tree branches down, and left them laying in the course. 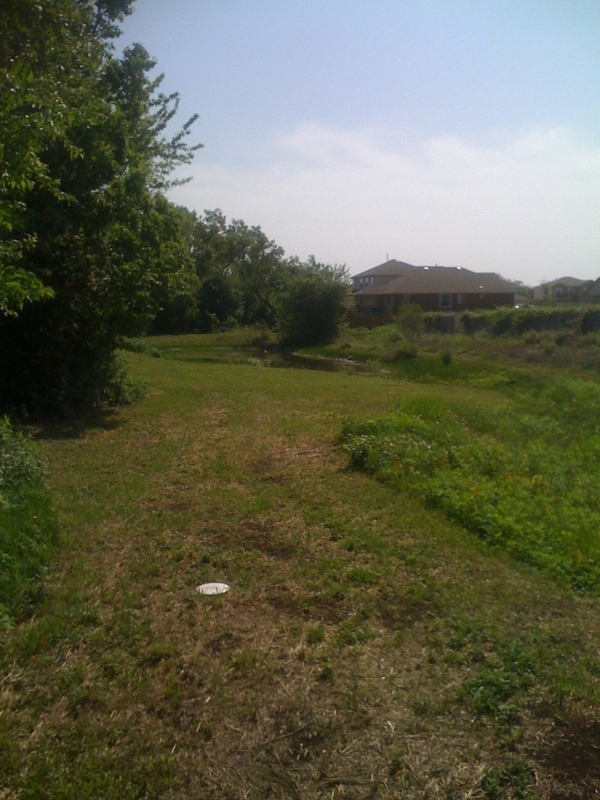 There is a creek running through the course. Of course, we lost discs in it! You had to cross the creek at different points. Each time, the only way to get across was one thin board. The only problem with that was that one end was usually in the water. The greens are pretty narrow. And the rough is very rough. It is quite easy to loose discs in the tall grass. 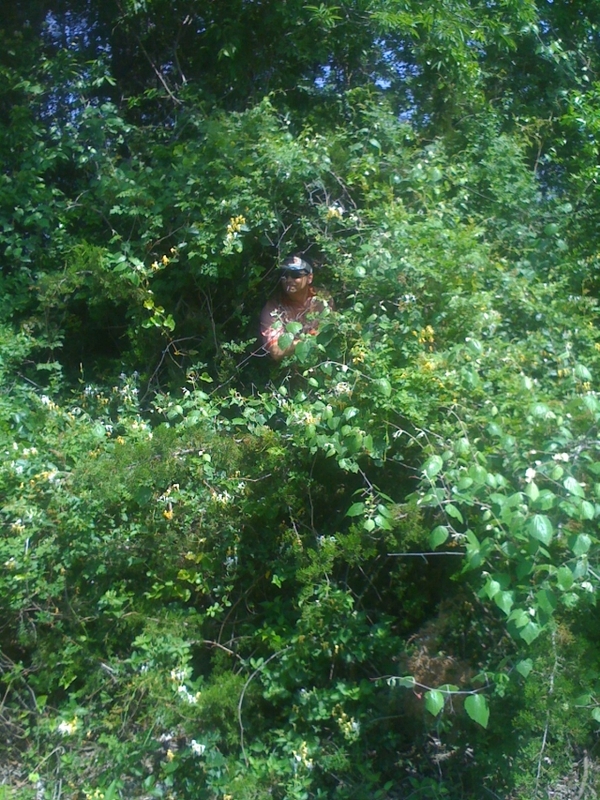 If that wasn’t enough discouragement, right next to the rough is an impenetrable wall of brush and trees. I had a couple of good throws. But I tried to generally play it safe. Can you see that body of water in the distance? Well the basket is on that small hill behind it. There is about twenty feet of green around it. 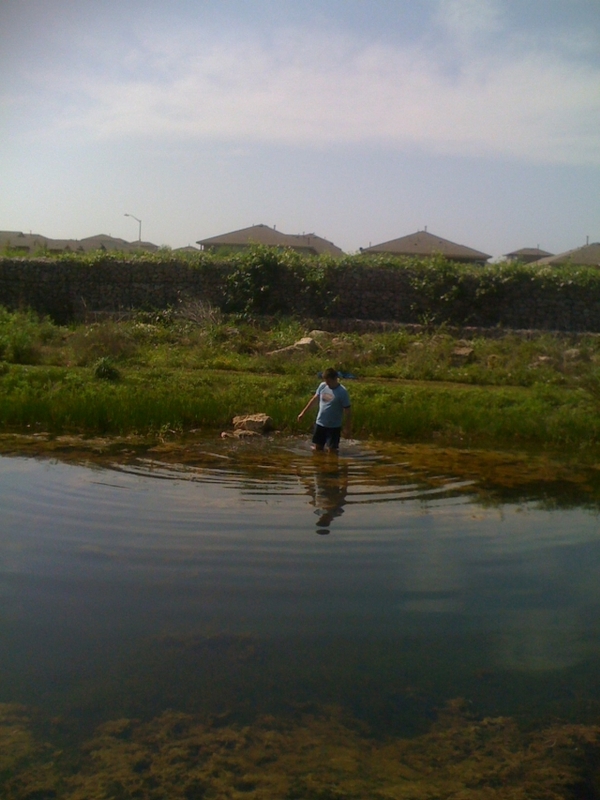 Jon threw his disc in the water. And if I wasn’t spotting his throw for him, he would have never found it. It disappeared into the muck without any trace. 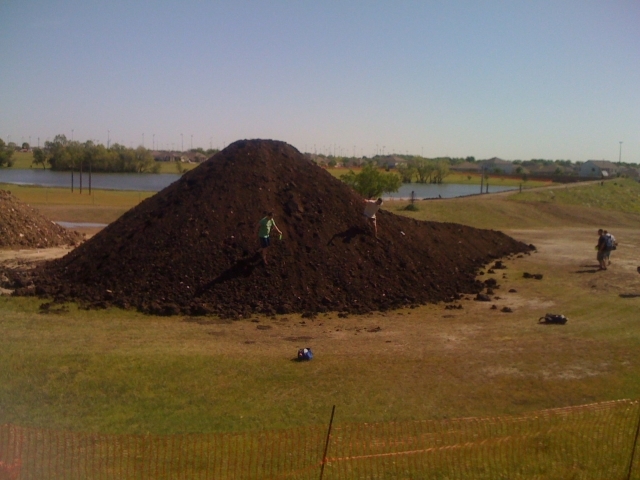 Apparently Jon stirred up more than just muck in that pond. An aggressive water moccasin started swimming around in it after he left. It went back and forth towards people. 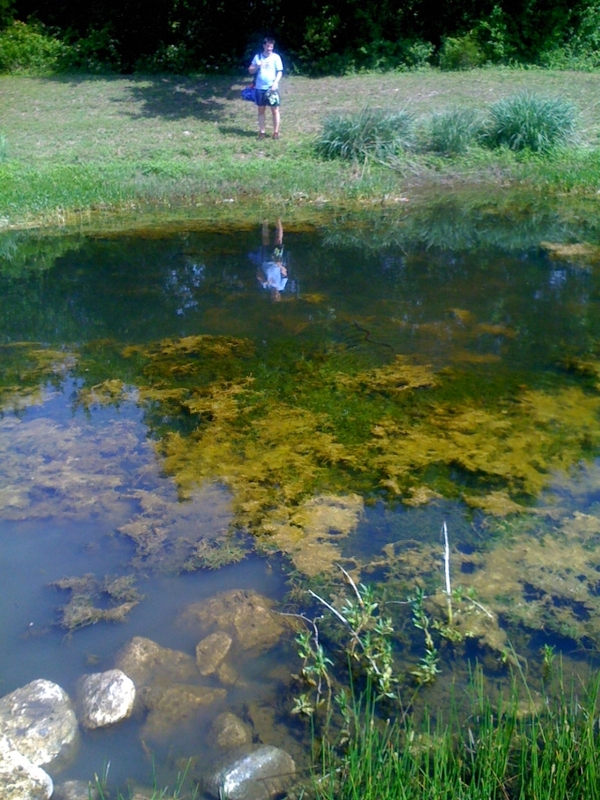 Can you spot it just past the green pond scum? That wasn’t the only time you had to throw across the water either. The tee for seventeen is on the other side of another pond. 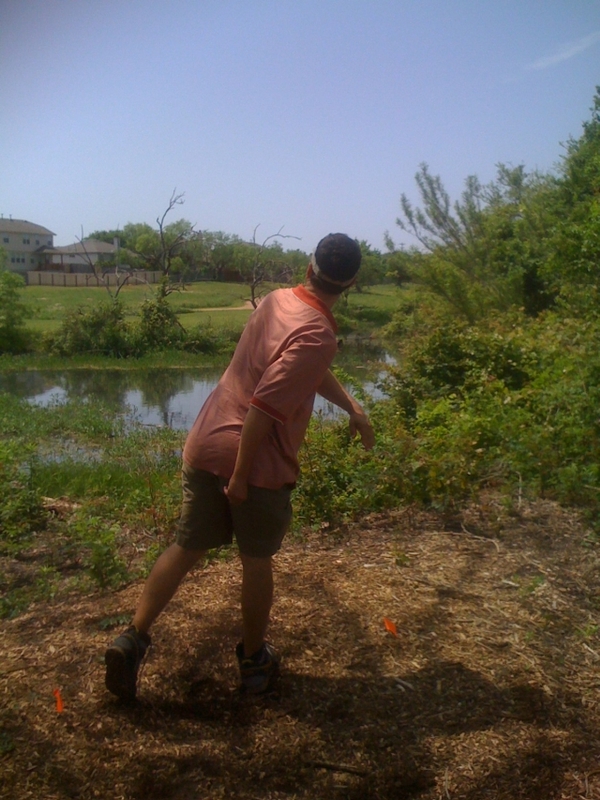 This entry was posted in Disc Golf on April 26, 2008 by Mark. It been a while since I have made pizza. So sad. I was distracted by high-tech gadgets. Don’t worry though, Mr. Pizza. I would never put you in a vacuum bag and submerse you in water! 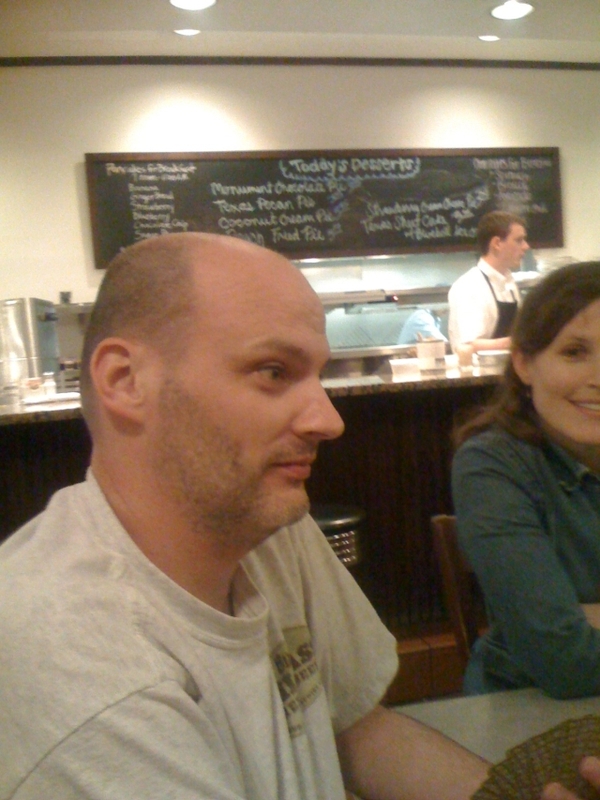 This entry was posted in Cooking on April 25, 2008 by Mark. I had an interesting experience at the pump today. With gas at all-time highs, I finally hit a limit. 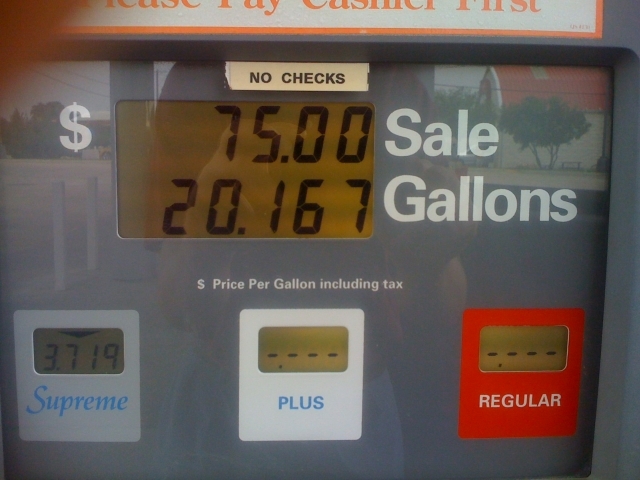 The pump stopped at exactly $75.00. But the tank was not full yet. When I inquired within, I was told that my credit card must have a limit on it. So I swiped the card again and put the last couple of dollars in to top it off. Sigh. What a stupid security measure! The company does not want me to spend more than 75 dollars on gas at one time. But they do not mind if it do it immediately again. I should figure out what car I want to drive next. I would love to get a 2008 Corvette ZR1. 638 horse power! Mmmm. But I can’t really justify spending 65 thousand dollars (assuming that I can find one at that price). A Volkswagen Jetta Blue TDI diesel would be interesting. At least in theory (making your own bio-diesel ). But diesel, which was once cheap, is now more expensive than super-unleaded. Plus, I would want to cut down on weight and get a two seater version. And it would be nice if it was a plug in hybrid as well. This entry was posted in Complaints on April 25, 2008 by Mark. Cool. 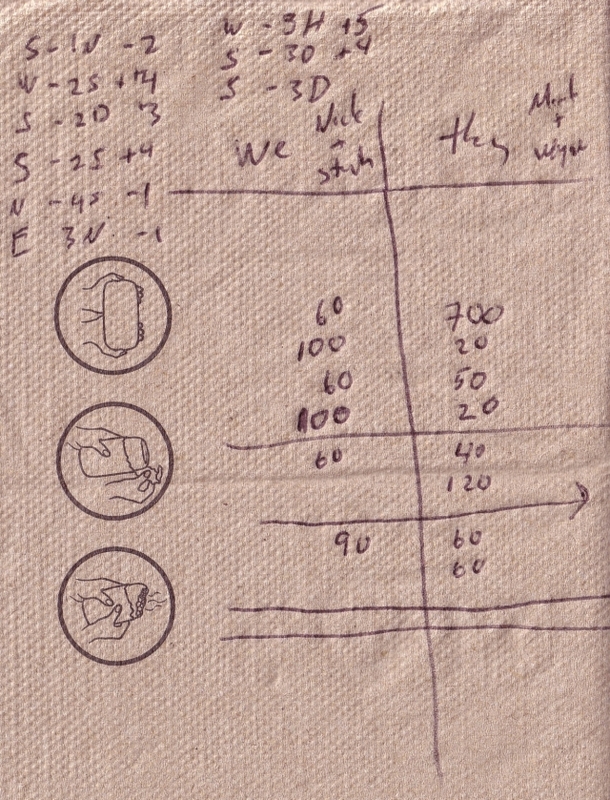 We played a game of Zepter. I started off strong. I was able to build my economy up to four diamonds before everyone else. But I just kept it there and let the other people catch up in income generation. The endgame took far too long for my strategy. We did have an amusing ending though. Someone myself, Doug and Jon ended up having the same number of victory points. And this game does not have a tie breaker! This entry was posted in Gaming on April 24, 2008 by Mark. I definitely like Tichu much better than bridge. You are more involved. You don’t have to sit out on hands. And good hands don’t necessarily mean good cards. 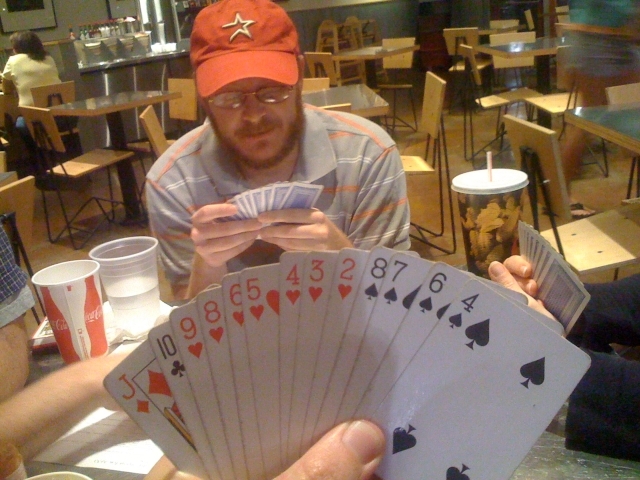 For example, my hand could make Tichu if the opposing team had got down in cards and I was able to play a single 8 (then bomb, play a jack high straight and then the 4). Out of curiosity, how should I keep and present the bridge score? This entry was posted in Bridge on April 22, 2008 by Mark. 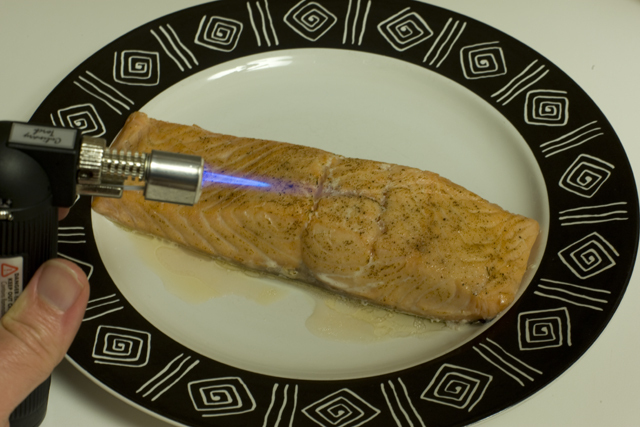 Next up with the sous vide experience was cooking Salmon. 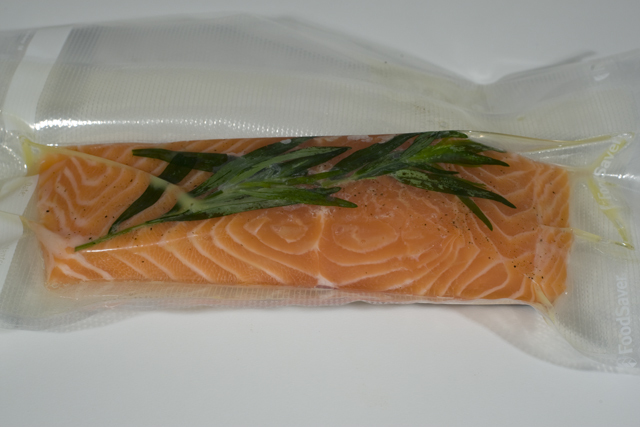 I bought a half of a pound of Atlantic Salmon and brined it in a 10% salt water solution for ten minutes (to help prevent the albumen from leaching out during the cooking). After patting the salmon dry, I then cut the it in half. I salted and peppered the fillets, poured a little bit of olive oil on them, and also put some garlic power on them. In one bag, I placed some tarragon. In the other, nothing else was added. I cooked the fillet in 116 degree Fahrenheit water for an hour. When I removed the fish from the bag, I patted the top dry with some paper towels and then used a culinary blow torch to brown the top. This entry was posted in Cooking on April 20, 2008 by Mark. 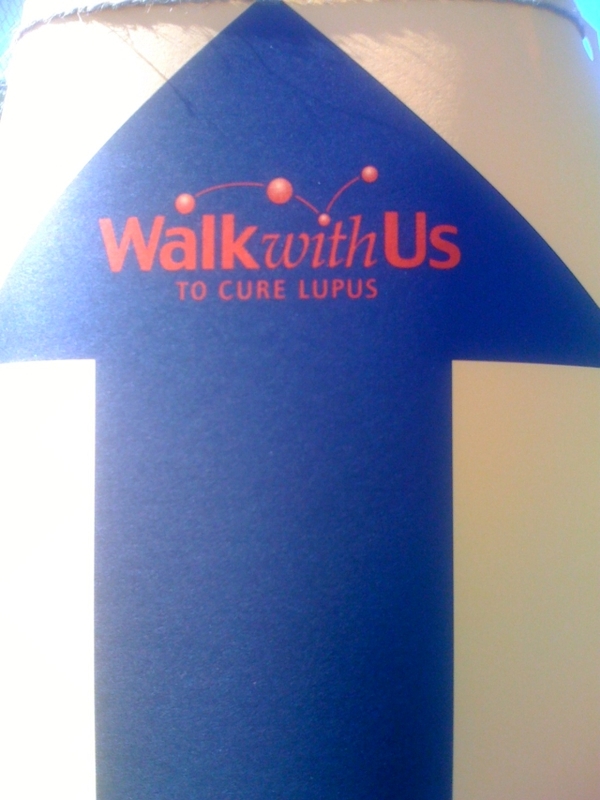 This entry was posted in Web links on April 20, 2008 by Links. Fortunately, my disc went around the mound. But, unfortunately, we could not convert it into a birdie. Jon was off of his game today. And I blamed him, of course. Its never my fault! 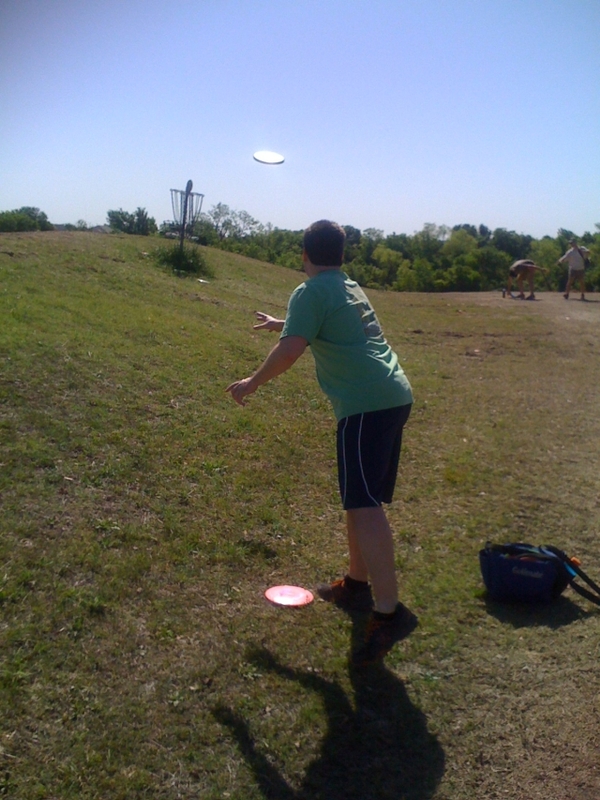 This entry was posted in Disc Golf on April 19, 2008 by Mark.